Healthcare in India is all set for a mega makeover with at-home world class medical care with utmost convenience becoming a reality. Dabur India Ltd, has joined hands with Dr Gareth Jones and Charles Walsh, the founder of the UK-based Healthcare At Home, to introduce the concept of managed at-home healthcare services in India. The new joint venture Company – HealthCare At Home India (HCAH) will work with corporate hospitals and doctors to offer critical healthcare services in oncology, pulmonology, post-operative care (orthopedics, cardiac, bariatric etc), critical care and palliative care, to patients in the closed confined and comfortable environment of their own homes. Although homecare facilities are much in demand globally, the same is at a nascent stage in India. This joint venture will seek to bring about a big change in patient care in India by adapting this global best practice to suit the specific needs of consumers in India. Health Care at Home India will also be adding other services such as maternity and aged care. Its success is founded on providing the highest quality services delivered by well trained and experienced staff (specialist nurses, HCAs and physiotherapists). It also uses empanelled doctors when required. “It’s a well-known fact that being at home can bring happiness on the faces of even the most critical of patients as they struggle through a chronic or acute disease. Critical care in the home is an affordable option. In fact, it is both financially affordable and psychologically important to keep elderly and ill family members in the familiarity of their homes as it is the ideal healing environment, where access to loved ones and familiar surroundings shortens recovery time. This can only be achieved through employing experienced, well-trained healthcare professionals delivering doctor-approved care protocols. 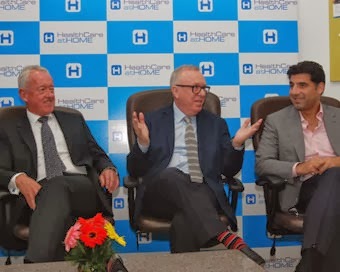 With this joint venture, we are introducing this affordable but high quality at-home healthcare service in Delhi-NCR,” said Dr Gareth Jones, Chairman, Health Care At Home India.